When you buy an octagonal picnic table online from PlaygroundEquipment.com, you’ll get a great price on a sturdy piece of commercial-grade equipment for your outdoor space. We specialize in providing a wide selection of safe, fun, and attractive playground equipment and outdoor furniture. Browse our selection to find an octagon picnic table for sale that suits your budget and your space. We offer low prices on products from the industry’s top brands! An octagon picnic table elevates a simple picnic into an outdoor dining experience. This stylish yet functional piece of outdoor furniture appeals to diners of all ages, and we have a variety of octagon picnic tables for sale in different sizes and colors that can be used in both commercial and residential settings. Consider the many advantages of having this type of table in locations like child-care centers, parks, campgrounds, schools, community centers, churches, and public facilities! Whether a child-care center is in the home or located in a separate facility, children and their parents alike appreciate when the kids can enjoy some time outdoors. A top priority is providing children with a fun, safe environment in which to play, but in addition to installing playground equipment, it might be a good idea to buy a child-sized octagonal picnic table for lunches or snacks out in the fresh air and sunshine. We offer a variety of models for sale online at affordable prices! 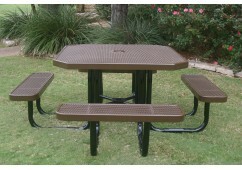 Our commercial-grade picnic tables for sale are perfect for parks and campgrounds. They are sturdy and meant to withstand use by large groups of people. Make your park inviting with the addition of an octagon-shaped picnic table: You can choose a table color that blends in with the scenery or pick a color that turns the table into an accent piece. Either way, visitors will enjoy using the table for eating and playing games. Educational institutions look for ways to enhance the on-campus experiences of their students, faculty, and staff. One way to do this is by designating an outdoor eating area. An octagonal design is an attractive alternative to standard table shapes and adds a contemporary feel to the campus. Placing picnic tables near college dormitories and other gathering places can give students more opportunities to connect with each other. A unique picnic table tells guests at senior centers, sporting venues, fitness facilities, and other community centers that they are welcome to linger for longer and to come back again. Place these tables near the center’s food services for convenience, and organize picnics as part of the center’s regular activities so that patrons can enjoy each other’s company outdoors. There are lots of uses that make an octagon picnic table a worthwhile purchase! It’s time to move the church basement potluck outdoors. Encourage members of your congregation to join in fellowship together around the picnic tables! Engage kids and adults with fun games, or turn up the music and watch friendships grow. Place a table with an intriguing shape near your organization’s youth center or in the kids’ playground area. Art and architecture are central to the design of many public facilities, including government offices, museums, and shopping centers. 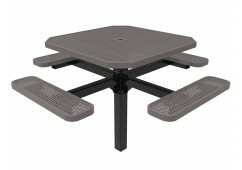 At PlaygroundEquipment.com, you can select any of our top-quality octagon tables for sale and find a table that fits the trendy style and color themes of your building. Our easy-to-install tables give you sturdy construction without compromising on style. The public will thank you! When it’s time to place your order for an octagon picnic table, our representatives are always available by phone or online to chat with you and help you select the equipment that is right for you. Get a free quote now to get started!